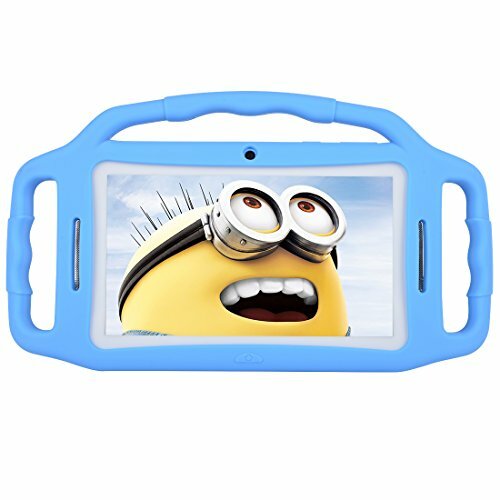 Portability and easy for Kids to use: Android 7.1 tablet 7"HD Display Quad Core ,1024 x 600 HD screen with Front and Rear Cameras,WIFI,Bluetooth, 1GB RAM/8GB ROM, You can expand the storage to 32 GB with an extra micro SD card to store photos, music, and videos. iWawa APP with parental control: Kids Mode pre-installed,With Kids Mode,kids will have their own personal playground. With built-in parental controls, parents can manage what apps, E-books for kids to play and set playing time limitation for kids. Parents can create different profiles for different kids to share one tablet. Kid-proof Case: Made of high quality soft silicone material,Soft,Durable, lightweight case to against drops and bumps caused by kids while playing. No need to worry about any potential harms. Additional plastic tablet stand to assist children while studying, watching and playing games. Don't bother to hold the tablet.